We hope you’re having a wonderful summer, full of fun, quality family time and even a few moments to relax. 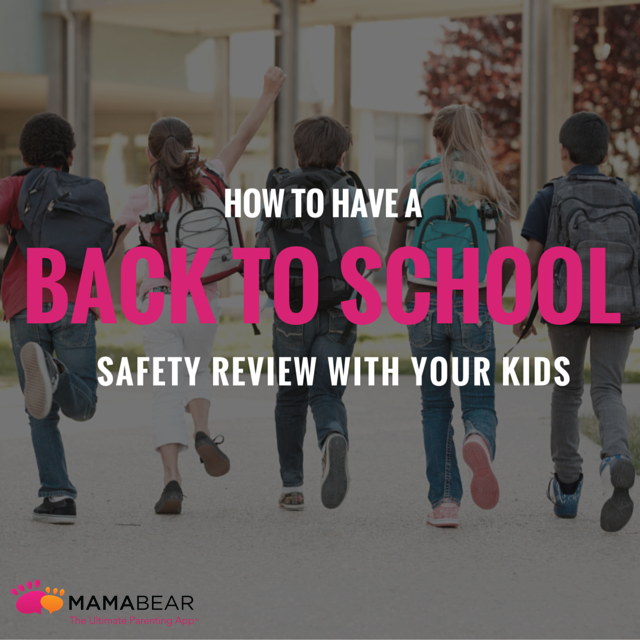 At MamaBear we’ve worked hard all summer to get you ready for back-to-school with a ton of new features to protect and connect your family and give you the peace of mind parents deserve. Start this school year giving your kids the freedom they want and use MamaBear to ease your worry with responsible parental supervision. We’ve added the new features you’ve asked for, and still deliver it all in your convenient Family Newsfeed right on your mobile phone. If your child is using an Android device you can now see all of their incoming and outgoing text messages. Mom and Dad can use any phone, iPhone or Android. This has been our top feature request and it’s free! Simply go to your child’s profile settings and tap “text alerts.” Then tap “Turn On” in the top right hand corner. Now you can see what your child has been viewing on YouTube, the world’s most used video and music site among teenagers. See their viewing history right from your Family Newsfeed anytime. We’ve added the popular site Tumblr to the list of social monitoring. Go to your child’s MamaBear Settings profile and set up this along with Instagram, Twitter and Facebook. We’ve added a quick one-touch feature in the child app for a fast way for your child to get in touch if they need you immediately. It alerts all the guardians instantly if needed. Check-ins are more fun now with Do0dles to the family. If you’re an early tech adopter, you’ll love getting your MamaBear notifications right to your Apple Watch. Kids can quickly check-in from the watch, too. Share the gift of family safety and earn free premium subscription when you share MamaBear with your friends. Your friends will receive a free two-month premium upgrade and so will you, every time you share the app with someone new. Learn how to start sharing. Easily remind your child to log in to MamaBear. Resend them a one-tap log-in link by going to their profile settings in your app. And there’s lots more in the way of performance improvements, location enhancements and customization options! A new school year means extended independence, new friends and different places to go, so be sure to use the original MamaBear features and set up Safe Places for arrival and departure notifications, make sure a Driving Speed is set for your teen, and that you’re connected to your child’s social media including Instagram, Twitter, Facebook and now Tumblr and videos with YouTube. Keep your kids engaged with MamaBear by sending them messages. The more they open and use the app, the more often you’ll receive accurate location updates. Share your location with them and break down barriers for staying in touch. And don’t forget you can receive your child’s team sports events and messages right in MamaBear through your TeamSnap account without having to open another app. Explore the new features and get back to MamaBear by re-installing or updating the MamaBear App to the latest version, 4.9 and start enjoying a whole new way to parent in the digital age. Our support team is on standby if you need help logging back into your account. We hope to hear from you. The beginning of the school year is a time to start new and refresh the old. As you prepare by buying school supplies and looking over new class schedules, use this time to refresh another important element of your child’s life — safety rules. Review these important back to school safety rules to help set the stage for a great and safe new school year. Only accept friend requests from people you know. When you accept requests from strangers, you can never be sure who they really are. People create fake profiles to target teens and younger users, so always ignore requests from people you don’t know. Never meet someone you met online in real life. If you happen to meet someone online who you don’t know, never agree to meet them personally. This is one of the most dangerous situations created through social media. If someone repeatedly asks you to meet in person, tell an adult. If you experience bullying online, tell an adult. If you are being bullied, do not respond as that can make things worse. Also, if you see someone else being bullied, don’t get directly involved. Instead, tell a trusted adult, parent, or teacher who can help resolve the problem. Don’t give your password to anyone. Even if a teacher or adult asks for your password, say no. Tell them you need your parent to be there if they want to access your phone. Always think twice before sending a text or photo. If you don’t know if you should send something (or post it online), ask yourself how you would feel if the message were posted on the front page of the newspaper. If you would feel embarrassed or ashamed with your post going public, don’t share it. You never know what can happen to your content once you send it to someone else, so only share things you feel comfortable with the world seeing. Do not look at your phone while walking near streets. When looking at your phone, you become unaware of your surroundings and are less likely to see a vehicle coming near you. Never look at your phone while driving. Distracted driving is the number one cause of teen accidents. Put your phone in the backseat while driving and utilize the “#X It Can Wait” campaign to pause your text conversations when you get behind the wheel. Obey the speed limit and practice safe driving. Limitations on speed are set for a reason. It is for your safety and for the safety of others on or near the road. Always adhere to speed restrictions to protect yourself and those around you. As a parent, you are probably already using your phone to prepare for the new school. Over 75% of parents use their phone for back-to-school shopping to find coupons, compare deals, and find nearby stores. But there is another way for parents to use their phones to prepare for the upcoming school year. The MamaBear app, which is available for iPhones and Androids, provides parents with real-time updates when their child gets a new follower and posts a message through their social media accounts. It also uses GPS technology to send alerts when your child reaches their intended destination or goes over the speed limit while driving. It is a Peace of Mind Parenting™ app that turns your smartphone into a tool to make the back-to-school season safer and less stressful for both parent and child.